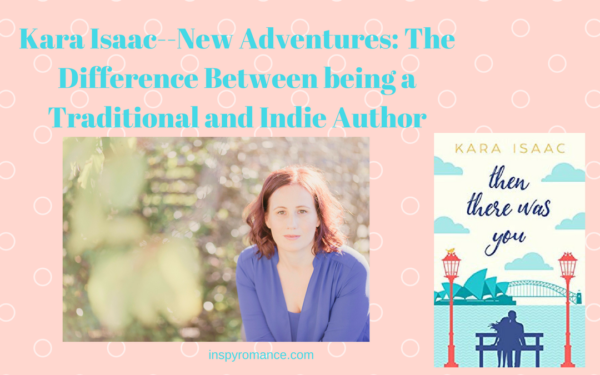 I’m excited to invite Kara Isaac back to tell us about her upcoming release, Then There Was You! In six days, my first indie (independent) release, Then There Was You, heads out into the big wide world. 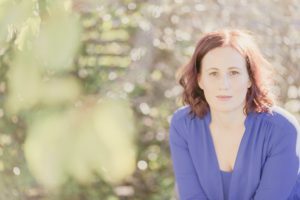 After two traditionally published novels (Close To You and Can’t Help Falling) I thought it would be fun to talk about some of the differences I’ve discovered between working with a traditional publishing house and being my own publisher! How exciting! What differences have you discovered? Being an indie author means total control! You are the final decision maker on everything from cover, to back cover blurb, to distribution channels. This is both great and terrifying! There is no one chasing you up to make sure things are done by specific times and no contractual obligations to motivate you to meeting milestones just your own internal motivation. If a step is missed or something doesn’t get done it’s your responsibility to notice it and fix it. If the cover doesn’t hit your target reader demographic, if the back cover copy doesn’t engage them, if a promotional activity doesn’t pay dividends, it all comes back to you. Right! That can be fun and scary! I am so blessed that I got to work with an incredible team at Howard Books and am so grateful for the experience. Being an indie meant I had to pick my own team! For Then There Was You this included a developmental editor, a copy editor, a proofreader, a cover designer and a formatter. I had worked with my developmental editor and proofreader before, my cover designer’s work I had admired on a couple of author friends’ indie releases, my copy editor I knew from writing circles and my formatter was a recommendation from an indie friend. They all did incredible work and getting Then There Was You to this point wouldn’t have been possible without them! Being an indie author for the first time is a many months exercise in discovering how much you really don’t know! From getting an ISBN for your book, to navigating tax requirements, to making decisions from pricing to the color of pages, to getting advance copies to early reviewers, you’re it when it comes to navigating from the first draft right through to release. Thankfully the indie author community is a very helpful supportive one and people are always willing to point you in the right direction or share their expertise and experience. All the picking out is kind of like building a house. Yes, the indie community is so supportive, as is the Christian fiction community as a whole. My primary motivation for going indie was that with two novels releasing in 2016 I wanted to have a 2017 release to maintain momentum with readers and (for a variety of reasons) that wasn’t going to be possible with my traditional publisher. All of these things were covered by my traditional publisher. Being indie means paying the bills and watching the $$$$ disappearing out of our bank account! LOL, I’ve been there–making sure you can prove a return on the investment for the husband! Thank you so much for having me here today! 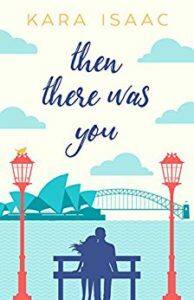 I have TWO Kindle eBook copies of Then There Was You to give to two lucky commenters (also a bit of shameless promotion the eBook is also on a preorder special of $3.99 until midnight on the 21st :) I will be popping back in to respond to comments/questions later in the day (thanks to the time difference with New Zealand I don’t even wake up until the US is well into the afternoon) and I’m also juggling three small people so please bear with me if it takes me a couple of days to reply! I’ll try to be patient, ha! Thank you so much for your generous offer. No worries about the promotion! I know our readers will be excited to order. Sounds amazing! I can’t wait to read it! Thank you so much, Kara, for hanging out with us! READERS, Leave a comment by June 20, 2017 to be included in the giveaway! Thanks for sharing your experience and your latest book with us, Kara. I look forwarding to reading, Then There Was You. HI Jill! Thanks for welcoming Kara again! Hi Wemble! I hope to visit y’all’s side of the world someday! Looks beautiful! Hi Wemble! Whereabout do you live across the ditch? I’m very envious that you’re winter weather is so much better than ours! Hi Janet and thanks for the introduction. Welcome Kara! Thanks for an insightful and educational post about the publishing business. Your new book sounds delightful. This retired high school teacher can relate. I was a pastor’s wife for 25 years and lived in Chicago for 10 years. My younger brother was a violinist. As a retiree, most of my travels today are in the Midwest or via my arm chair through books and posts from friends. My furthest travels from the Midwest was to Japan in 2008. That 15 hour flight was long enough, so not sure about a lengthy flight to Australia. So your story catches my interest – how will a violinist from the Midwest adjust to a different culture and seasons in the land down under. Intriguing. When not reading or interacting with authors around the world, this grandma chases two adorable little granddaughters ages 3 and 5 months four days a week, while their parents work. Since it is now summer break and I also entertain two grandsons ages 11 and 9, who come to my house for the food. Best wishes Kara. Happy writing and enjoy those precious little people. Hi Renate! Wow, you are one busy grandma. Your grandkids (and children!) are so blessed to have you able to be so involved! We don’t have any grandparents living in the same city as us and definitely miss it. If you’ve made it to Japan you could definitely make it to New Zealand and Australia. From Auckland to LA it’s about a thirteen hour flight and I think it’s roughly the same from Sydney to LA as well :) I hope you enjoy Then There Was You if you have the opportunity to read it. I enjoyed the interview! I am adding the book to my TBR list. I really like the cover, too! Thanks, Elizabeth! Isn’t the cover cute? Hi, Elizabeth! I’m so glad you like the cover :) It’s a very different style to my other two but I love it. I hope you enjoy Then There Was You if you have the opportunity to read it! I enjoyed learning more about the traditional vs indie publishing process – thank you, Kara and Janet! Hi Laura! Thanks for stopping in! Yes, I was interested in the traditional side, since I’m indie. It was fun getting to hear a little bit more about Kara and the process of indie publishing. It really must be scary, but you needn’t worry, you are a fantastic and skilled writer. I’ve enjoyed your other books. I look forward to reading this book, I’ve seen it being promoted by others on Facebook and I think it will be a big hit! Yes, her other books are wonderful! Can’t wait to read this one, too. Have a great day Marilyn! Andrea, it is great how everyone helps each other!! Hi Andrea! Yes, daunting is definitely a good word for it but it has been a lot of fun too :) I hope you enjoy Then There Was You if you have the chance to read it. Thanks for sharing your experience as and indie author. I know other in this blog publish like that too and it’s good to hear more about the work of the authors we support. Yes, Many of us have ventured into indie! It’s been fun! I think it’s a great idea to indie publish in between your other books to maintain momentum with readers. I think that this book will definitely accomplish that, I know it has for me, just having another book from you to look forward to. I absolutely love the cover!!! Heidi, I agree! It’s a great idea! Thanks so much, Heidi! I’m so glad you love the cover. It’s very different from the other two but I love it as well :) And yes, now that I’ve taken the leap I am very excited that it’s only been nine months between Can’t Help Falling and Then There Was You rather than potentially a couple of years for readers to wait! I can’t wait to read your book, Kara! And thanks for all the effort you had to bring your story to us. I would never imagine all the effort behind publishing a book..
Hi Laura! It’s a labor of love for sure! Thanks so much, Laura! I hope you enjoy it :) Yes, there’s definitely a lot of moving parts to getting a book released but I’ve enjoyed learning about them all! I loved the blog post and it was informative. Congrats on the new book and I would love to read. Yes, only a few more days to wait for Kara’s next book!! Yeah! Three real life babies and three book babies! Loved the first two books so I’m looking forward to reading this one, also. Arletta, That is a fun correlation! Book babies! It is like putting your child out there for the world to critique. I get nervous every single time!! Enjoyed your post and also enjoyed Close to You! Looking forward to reading more of your books! Wasn’t it great!! Thanks for stopping in, Jackie! Janet, thanks for sharing Karen’s experience with us. HI Merrilee! I was excited to have Kara back! Hi Kara! So excited about your new book! And thanks for going to such lengths for your readers! I think most of us don’t realize what you all have to do besides just writing the story to get a book published. Hi, Nancy! It is a lot of work. If I didn’t write Christian fiction, I probably wouldn’t stick with it. For God and readers, it’s worth it! Thanks, Kara and Janet! You are both such amazing writers! I’m looking forward to reading your book, Kara. I think it’s next on my list, so I should be finished by release day. Hi Winnie! You are so kind and encouraging! Thank you!! Love the blurb, and that cover is awesome! I may need to message you to find who your cover designer is, because I need the same style and feeling for a release planned for early next year. I tried to get something similar but set in London for my first indie book, but ended up paying for an epic fail! The book deserves to do wonderfully well, and I’m sure it will! Oh Autumn, I’m so sad to hear you had to pay for an epic fail :( My designed was the lovely Jenny from Seedlings Design Studio – http://www.seedlingsonline.com. She is a dream to work with and I highly recommend her. You’ll see from her portfolio that she has done designs for a number of inspirational romance authors. I appreciated the information on what you have to do when you are independent. It makes me more grateful for what you authors have to do and why reviews are so important. If I do not win, I will end up buying it. Now I have to decide ebook or paperback. Oh yes! Reviews are so important!! Ah, so many choices! Paperbacks are fun to share! Thank you so much! I really appreciate your support :) I hope you enjoy Then There Was You in whatever format you read it in. And yes, reviews are always ALWAYS appreciated by authors. Me, too! I’m sure it will be great! I do the same thing with books I love! Thanks for saying hello, Jebraun! All Kara’s books are fun! Hi Martha! I think it is but I’m a little biased ;-) I hope you enjoy it if you have the chance to read it. I have Kara’s first book, and can’t wait to read the next! I’m a teacher who loves to read in the summer! Hi Joy! I totally understand. I worked as a school librarian for seven years. Summer was for reading and projects around the house! Enjoy! Hi Joy! Happy summer reading to you :) I’m very jealous as I sit here wrapped up in my lounge against a winter chill that just swept in this morning! I hope you enjoy Then There Was You. I can’t wait to read this. Thanks for the giveaway! Hi Kathryn! I can’t wait either! Having read and loved Kara’s first two books, Then There Was You is a must read for me. Thank you for the background info of what it takes to produce an indy book, though I imagine this just skimmed the surface, and for the ebook giveaway. Hi Pam! So glad you are excited about this next book! I’m sure it will be great! Thanks, Pam! Yes, it’s definitely kept me busy the last six months but it’s been a great learning experience :) I hope you enjoy Then There Was You! Just finished Can’t Help Falling today after renewing it 4 times at the library! Can’t wait to read Then There Was You on my phone with no return dates ever! LOL! You sound like me! I renew books often. Thanks for all the work you do in writing books. Your new book sounds good. It does sound good! I can barely write and my children are grown (sort of 20 & 24), so I’m amazed that Kara has gotten all this accomplished this year!! Your article really put the Indie experience into words of what goes on in your world. The story of Josh and Paige sounds like they both need to met their own challenges. Hi Rory!! Yes, she explained the differences well! Great interview! Sounds like a great read! Looking forward to it! All Kara’s stories are fun that I’ve read! Will the characters from your other books make an appearance in this one? Oh cool! I did not know this! Great question, Brittany! I was away all last week at a camp with very limited wifi, so a bit late in responding! I enjoyed reading this informative and interesting post. I do like the frequency of books from indie authors! HI Margaret! Hope you had a great week at camp! I used to do church camp for many years. Great memories. Speaking of frequency, I need to get to writing! Hi Narelle! I’m looking forward to it as well! This sounds like such a good and fun read. I so need this in my life. Hi Dana! I hope you enjoy! Hi Kara – I read your article in the “War Cry’ and you captured my attention as soon as I read your comments on not being able to find Christian Fiction you actually wanted to read! For that reason alone I would be keen to read your books, and also would of course have very high expectations of them – lol! Well done on persevering with this obvious passion of yours. I have recently embarked on my own creative venture so I am finding myself being reeled in when it comes to finding out more about anyone who is prepared to persevere with something they are passionate about. All the best to you and your precious family. Oh wow! I need to read that article! Thanks for chiming in!